For the village in Lancashire of the same name, see Adlington, Lancashire. 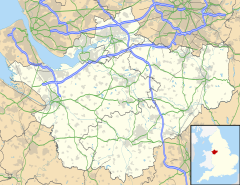 Adlington is a village and civil parish in the unitary authority of Cheshire East and the ceremonial county of Cheshire, England. It is known as Eduluintune in the Domesday Book. According to the 2001 census the civil parish had a population of 1,081 people across 401 households. There is a mixed, non-denominational primary school in the village. A railway station, located on the Manchester–Macclesfield line, is used mainly by commuters to Manchester and Stockport. Adlington was a chapelry and township in Prestbury ancient parish. It became a separate civil parish in 1866, and had slight changes to its civil parish boundaries in 1936. It was in Hamestan hundred, which later became Macclesfield Hundred and, later still, was assigned to be part of Macclesfield Poor Law Union and Rural Sanitary District. When Macclesfield Rural District council was established in 1894, Adlington became a civil parish within it. In 1974, local government re-organisation led to it becoming part of the Borough of Macclesfield, which in turn was succeeded by Cheshire East Council in 2009. Adlington Hall, dating from at least the end of the 13th century, is located at the western end of the village. Adlington made the news in January 2008, when a delivery vehicle shed 18 tonnes of mango chutney onto the road through the village. A spokesman for F Swain and Sons, the company which owns the lorry, said: "It was just one of those things." Adlington Parish Council, which administers the civil parish, is made up of ten parish councillors and one parish clerk. The parish council sits each month, and at these meetings, the two borough and single county councillor will also often attend. ^ a b "2001 UK Census". Retrieved 4 April 2008. ^ a b c "Home page". Adlington Parish Council. Retrieved 5 April 2019. ^ "Adlington Primary School". Archived from the original on 15 March 2008. Retrieved 25 February 2008. ^ Philips, A. D. M. and Philips, C. B. (2002). pages 10–11. ^ "Macclesfield Borough Council website". Archived from the original on 2 April 2008. Retrieved 4 April 2008. ^ "Adlington Hall". Archived from the original on 26 September 2008. Retrieved 4 April 2008. ^ "Chutney truck in a pickle". Manchester Evening News. 18 April 2010 . Retrieved 4 April 2008. Phillips, A. D. M.; Phillips, C. B. (2002). A new historical atlas of Cheshire. Chester, United Kingdom: Cheshire County Council and Cheshire Community Council Publications Trust. ISBN 0-904532-46-1. Wikimedia Commons has media related to Adlington, Cheshire. This page was last edited on 5 April 2019, at 11:54 (UTC).